This impressive structure is the Chicago, Milwaukee, & St. Paul (CM & SP) Viaduct, built in 1909. 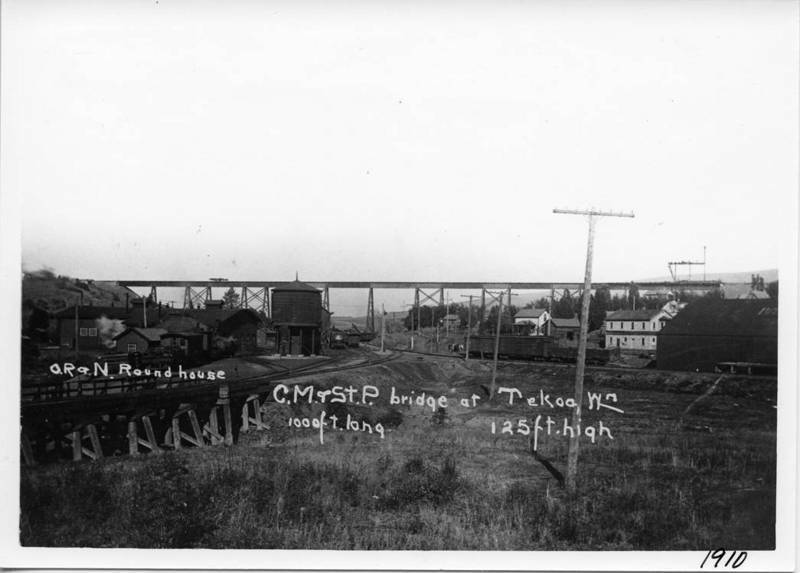 The CM & SP railway was, for the first few decades of settlement, one of the most important railroad companies in the Palouse region. 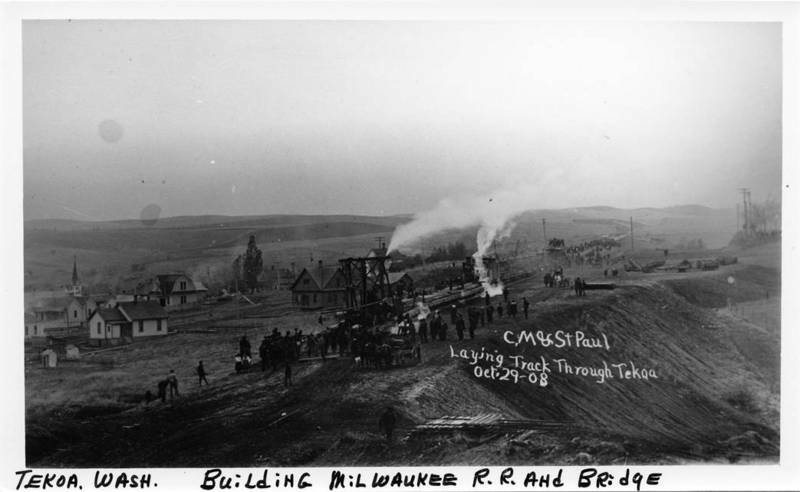 Although Tekoa was already established and still growing when the CM & SP built its tracks through town, it was made exponentially larger as a result of the construction of the bridge. 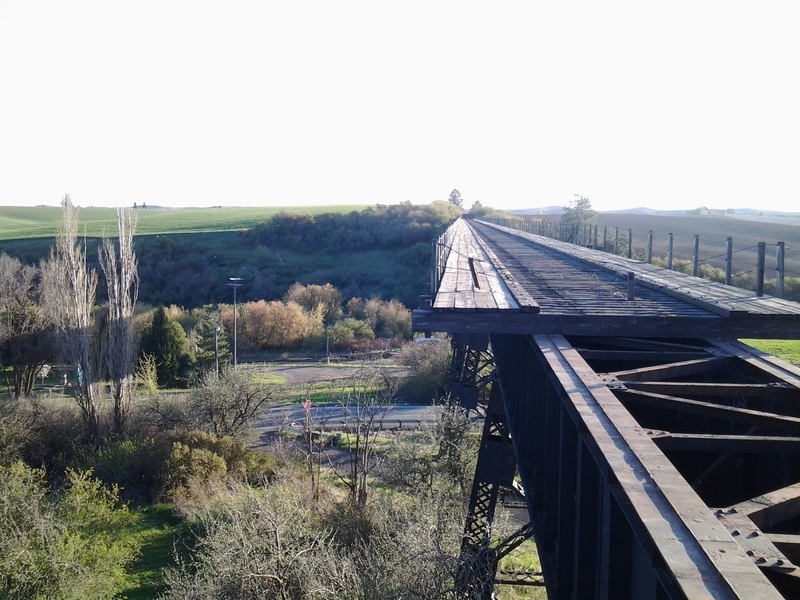 The 975 feet-long and 115 feet-high railroad trestle that runs just north of Tekoa represented not only the success of the town, but signified the success of one of the fastest growing and most agriculturally important regions of the Northwest. The Northern Palouse was seen by most railroad companies as being the most economically strategic route for the construction of new tracks in the early 20th century. Due mostly to the relatively level topography (relative to the central and southern portions of the Palouse, where elevation changes are more frequent and intense) and close proximity to Spokane, Colfax, and Idaho, Tekoa was a gateway to markets east of the Rocky Mountains. Lumber, ore, manufactured goods, grain, and fruit shipments all made Tekoa, from 1900 through 1920, "one of the busiest places in the Inland Empire." It was important enough for the CM & SP that they assigned one of their star engineers, W.E. Dauchy, as head of the company's operations at Tekoa. Dauchy was previously chief engineer in charge of the Culebra Cut phase of the Panama Canal. As the de facto capitol of the Northern Palouse, Tekoa became the CM & SP's most important hubs for Palouse exports, making Tekoa one of the most vital centers for the movement of Palouse agriculture. Even Northern Idaho's lumber and mining industries contributed to the town's prosperity. The CM & SP made a "swing around circle" every day to the Coeur d'Alene mining region - more than any other railway. Tekoa's "Wallace route" was the most popular means of travel and transport to and from Eastern Washington to Idaho's Silver Valley. It was so popular that another train had to be added to the route and more crews hired in order to keep workers and supplies going in and ore coming out. Millions of dollars of commerce passed through Tekoa every year, thus spawning the town's rapid economic growth, but once the trains began to pull service in the 1940s, the towns that grew up around them began to decline as fast as they expanded. 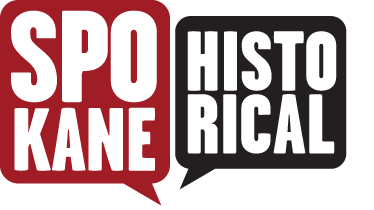 Highways and long-haul trucking began to take over in the 1950s, sealing the fate of communities across the Palouse. Wheat farming still abounds in and around Tekoa, but the immense quantities of goods which once traveled over this bridge, en route for destinations across the globe, are but a faded memory of economic times long since gone. 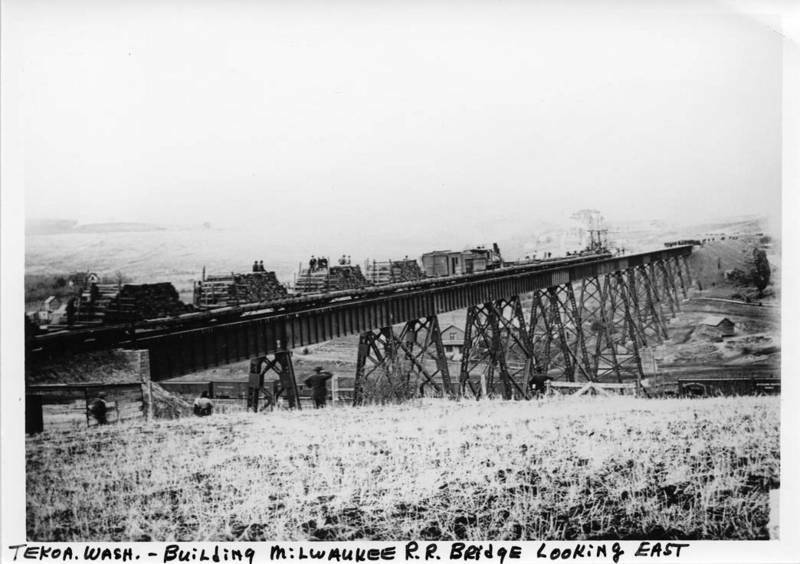 Milwaukee Bridge, 2014: Abandoned and unused, the Milwaukee Road Bridge can be dangerous. 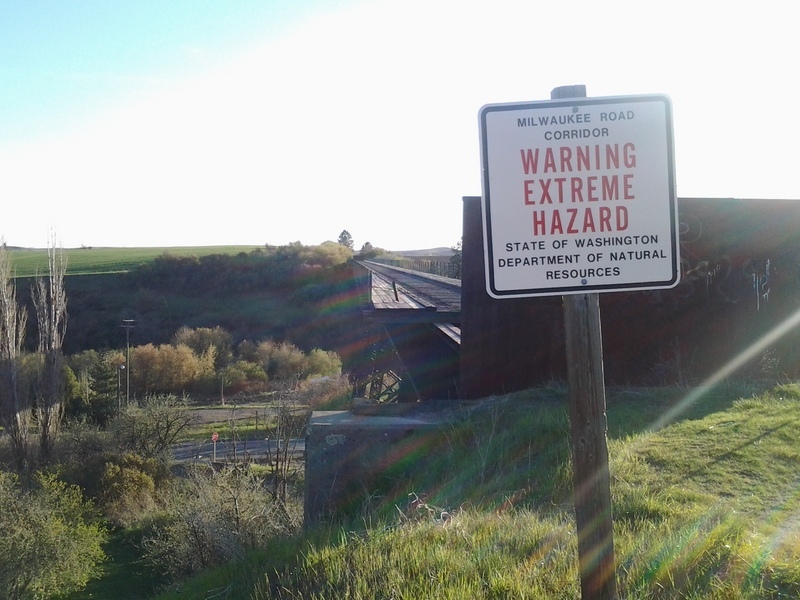 The northwest end of the bridge is blocked by a large steel plate, and a sign in front reads "Warning Extreme Hazard." The hill underneath both sides are private property. Please proceed via the Milwaukee Road abandoned railway, not through yards. Image by author, 2014. 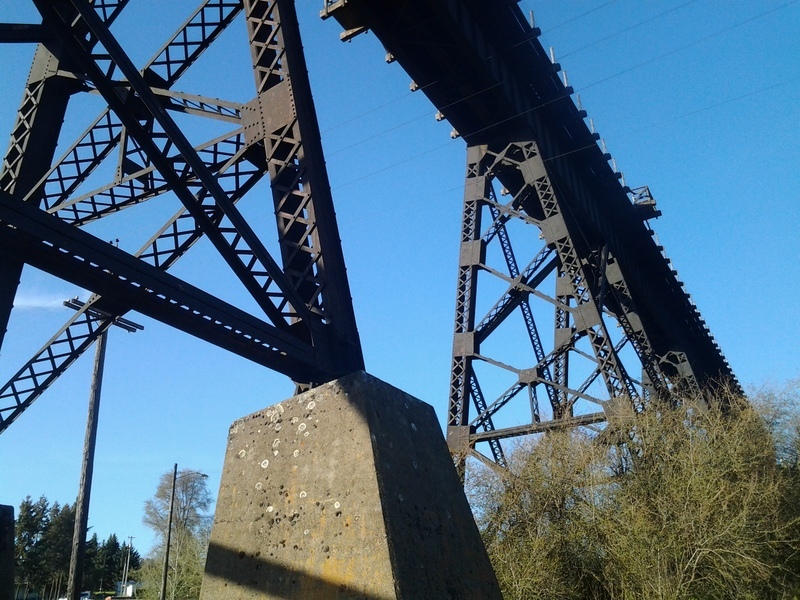 Looking up at the Bridge, 2014: Huge cement supports hold the frame of the bridge aloft. The basic design is purely utilitarian, but it even in the most basic sense, the bridge at Tekoa is still aesthetically appealing. Image by author, 2014. Looking East Across the Milwaukee Road Bridge, 2014: A view from atop the bridge. As you can see, around 30-feet of track was removed when the bridge was abandoned in order to discourage people from hurting, or killing themselves. Although passage onto the bridge is blocked, the spot still offers great views of both Tekoa and the surrounding countryside. Image by author, 2014. 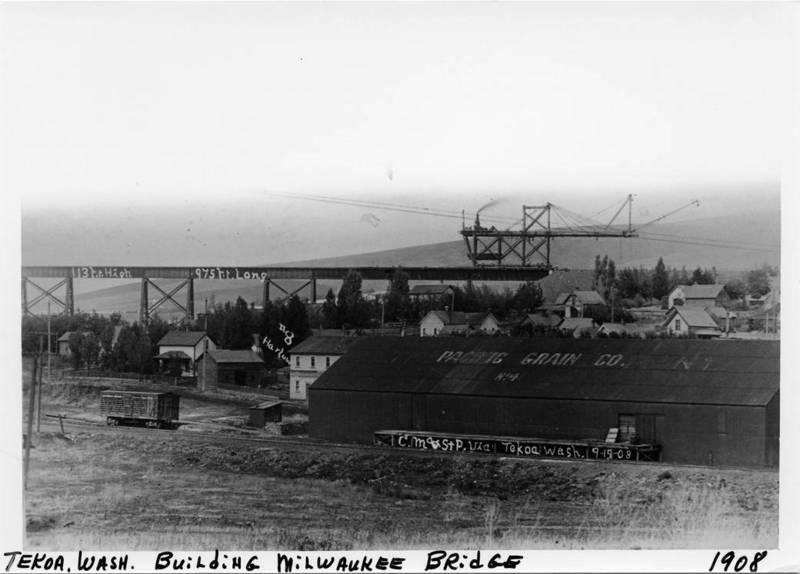 Robert M. Lambeth, “Milwaukee Road Bridge in Tekoa,” Spokane Historical, accessed April 20, 2019, https://spokanehistorical.org/items/show/426. C.S. Clarke. "Tekoa, Washington," The Coast, Vol. XIV, No. 6, December, 1907. Decisions Railway Board of Adjustment, Issue 1. United States Railroad Administration. Washington D.C.: Government Printing Office, 1919. Railway Age. Chicago: Wilson Company, Vol. XLII, July 6, 1906.